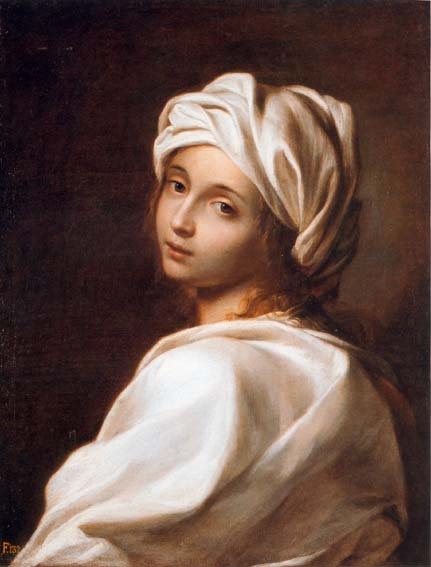 The noblewoman Beatrice Cenci died on the 11th September 1599 in Rome. Charged with the murder of her father Francesco Cenci, she was executed in front of Castel Sant'Angelo. The tragic story of this young woman moved the people of Rome and inspired generations of artists, writers and musicians who consigned her to the eternal memory of Art. Guido Reni (attr. ), Portrait of Beatrice Cenci (? ), ca. 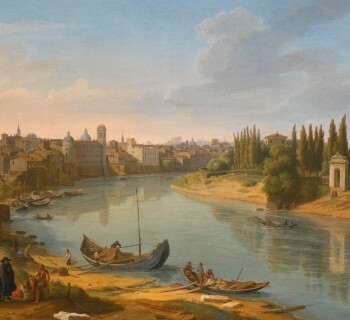 1662, oil on canvas (64,5 x 49) cm, Roma, Palazzo Barberini, inv. 1944 (F.N. 33289). Beatrice Cenci was born in Rome on the 6th February 1577, daughter of Ersilia Santacroce and the count Francesco Cenci. The Cenci was an ancient patrician family who boasted of descending from the Roman gens Cincia. The father of Beatrice, Francesco, was one of the wealthiest men of Rome. However, as also reported by the Italian dictionary of biography, his violent and dissolute temperament brought him several times to justice, contributing to the failure of his wealth as well as the crisis of his whole family. In this difficult environment, the little Beatrice grew up together with five brothers and a sister. Due to the frequent troubles and, perhaps, in the attempt to avoid the provision of a dowry for Beatrice which could worsen his financial situation, Francesco decided to shut his second wife Lucrezia Petroni and Beatrice in a castle at Petrella Salto in the Cicolano area on the Appennines in 1595, where he also retired himself two years later. In this grueling situation of imprisonment, Beatrice plotted to murder her father with the complicity of the stepmother Lucrezia, the brothers Giacomo and Bernardo, the blacksmith Marzio da Fioran, called il Catalano and the former castellan Olimpio Calvetti who was maybe his secret lover. After a couple of attempts, on the 9th September 1598 Francesco Cenci was hit to death in his sleep by Marzio and Olimpio and then thrown down the stronghold from a walkway, in order to simulate an accident. 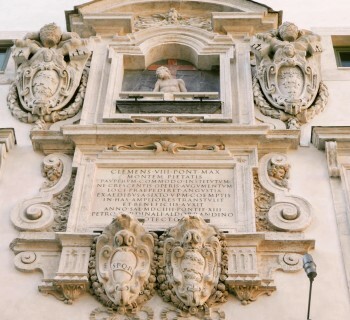 The rest of the Cenci family came back to Rome, at Palazzo Cenci in the Jewish Ghetto, but soon the suspects about the mysterious death of Francesco gathered around Beatrice and her accomplices. Étienne Dupérac, Vestigi del monumento, overo mole d'Adriano, 1575, engraving, from Stefano Du Perac. 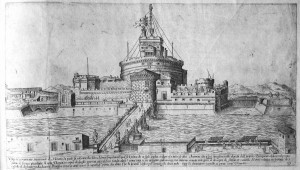 I vestigi dell'antichita di Roma raccolti et ritratti in perspettiva, Rome, Lorenzo della Vaccheria, 1575. After precautionary house arrest, questionings, imprisonment and tortures, Beatrice Cenci and the others confessed the murder. The trial had notable repercussion on the sympathetic people of Rome: Giacomo, Lucrezia and Beatrice were sentenced to death while the youngest Bernardo was sentenced to hard labor and compelled to assist to the public execution, ratified by pope Clemente VIII Aldobrandini. 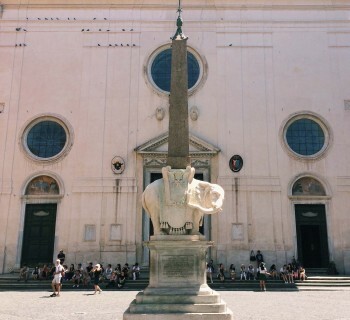 On the morning of the 11th September 1599, Beatrice Cenci was beheaded on the designated executioner's block located in the piazza in front of Castel Sant’Angelo. The painters Michelangelo Merisi, known as Caravaggio, Orazio Gentileschi and his daughter Artemisia are believed to be in the upset crowd who witnessed the execution. According to Beatrice’s willings, her body was then buried under a nameless tombstone before the main altar of the chiesa di San Pietro in Montorio. Nevertheless, Beatrice Cenci still lives in the popular culture imaginery, enriching the legends of the stormy past of Rome.